What is the Betfair Exchange? An overview. Andrew Black and Edward Wray founded the Betfair Exchange in the year 2000. They developed this revolutionary way to bet as a way of giving gamblers more control, so they weren’t at the mercy of restrictive gambling companies. While the idea was popular, and Betfair began to grow quite quickly, the platform only appealed to a certain subset of gamblers. For years, the Betfair Exchange has been seen as the domain of sophisticated punters. To a smaller extent, this is still the case, but it really shouldn’t be. Betfair has worked diligently to improve the education of customers who are perhaps intimidated by the unfamiliar layout, and terms such as laying and trading. Not only that, but they have automated certain aspects such as their cash out feature which enables users to trade at the click of a mouse. The Betfair Exchange is the dominant force in the exchange marketplace, and for a good reason. They have the most customers, which means more money in the markets, better prices and an increase in the ease of getting a matching a bet. If you have considered using the Betfair Exchange, but you’re perhaps intimidated, this article will help increase your understanding so you can escape the restrictive grip of the traditional bookmakers! Often the main confusion for many gamblers is that they do not understand the different type of bets that are available on the Betfair exchange. They log on, see an array of different boxes, and do not know where to click. If this is you, then worry no more. Because we are about to explain everything you need to know! A back bet is the easiest one to understand and something that you are probably already familiar with. You see, it is precisely the same as a traditional bookmaker bet. You just choose the selection you like, input your stake amount, and you click ‘place bet’, it’s that simple! The Betfair exchange gives you added freedom with this, though. Have you ever gone into your local bookmaker, seen a price, decided you don’t like it and asked for better? No, because they would laugh you out of the shop! But with the Betfair exchange, you can do exactly that. When you click on the selection you wish to bet on; two boxes will appear on your bet slip. On the right, you have your stake box, which is where you input the stake you wish to place. But on the left, you have the odds box. This is where you can change the odds, and ask for a better price than the one currently ready to be matched. By changing this to a higher number, and placing your bet, it will input your bet into a queue, ready for someone to come along and agree to taking that bet with you! Lay bets are where a lot of people become confused, but there is no need to be. When you lay a bet on Betfair, you are taking the place of the bookmaker. Which has its own appeal if you have ever heard of the saying ‘you’ll never meet a poor bookie’. So when you lay a selection, you offer someone a price, and you’re basically saying “I bet this won’t happen”. Should that selection not win, then you win the other person’s stake. If it does win, then you lose their stake multiplied by the odds you offered (minus their stake). This is called your liability and is displayed when you create the bet on your bet slip. So now you know the different type of bets, things may start to become a little clearer for you. But the betting screen is still unlike any other bookmaker, and all the boxes and numbers may confuse you further. But they are only there to help you, so don’t be alarmed. Here is an explanation of what everything means. The pricing ladder is showing you what prices are in the queue and the amount of money that is available for each selection.This is important because if there isn’t much money available for the current selection, you can see the next available price and how much money is waiting in the queue. The blue boxes are your back selections. When you click on one of these selections, they will appear on your bet slip on the right-hand side of the screen. The pink boxes are the lay selections. Clicking on one of the lay selections will display it on your bet slip. This is simply the amount of money that has so far been matched on the event. It gives you a good indication of how popular the event is and how liquid the markets will be. This is an important box to take notice of, especially if you wish to place a bet before kick-off, and have the option to trade in-play. Any fixture that has the ‘going in play’ box, is scheduled to be turned in-play. Please keep in mind, that should you place a bet pre-play that isn’t matched, this will be cancelled at the off unless you click the ‘keep bet’ button on your bet slip. This displays that the automated cash-out feature will be available for this market. This feature is particularly useful for beginners, so this is a useful tool to look out for. Well, there is a good reason that exchange betting has revolutionised the industry, and many smart punters bet via the Betfair Exchange. Firstly, the prices are industry leading. Traditional bookmakers usually build a percentage into their book so that the prices never add up to 100%. This is called the over-round and is basically how the bookmakers ensure their profit on an event. Because multiple people price the Betfair Exchange, the book in a liquid market adds up to around 100%, giving you a much truer price. You may wonder how Betfair make their money. Well, that is simple too. They take a small commission, typically 5%, of all winning bets. The ability to both back or lay a bet, means you can take a more comprehensive view of a market. Laying a selection and saying it won’t win is something you just cannot do with a traditional bookmaker.The ability to both back and lay a bet also brings a fascinating angle to your betting. It allows you to ‘trade’ the market. Ever since Betfair started, people have been using their platform to trade and make a nice profit, without studying form or making a judgement on who wins or loses. How? They just learn how to read which way a market is moving, and they back and lay selections at different prices to guarantee a profit! The best way to think of trading is to think of the stock market, and imagine the odds displayed are company shares! The one simple rule is this: buy low, sell high! So with the Betfair Exchange, the goal is to lay low and back high or back high and lay low. You may have even traded before, but not even realise it. Have you ever used the cash out function with a traditional bookmaker? Let’s say you place a 10 team accumulator with odds of 20.0 and your stake was £10 for a return of £200. Every team wins, and you are waiting for the final leg to win. They go into a 1-0 lead, and their price shoots down to 1.1. The bookmaker then offers you £120 guaranteed profit if you cash out, and nerves get the better of you, so you take it, happy that you got a good deal. This is trading, you backed high (20.0), and layed the bet off low (1.1) to guarantee a profit. Except, because you used a traditional bookmaker, the value was poor. If you layed that selection priced 1.1 on the Betfair exchange, you could have won about £70 more! This is due to the Betfair exchange offering you the actual value and a traditional bookmaker offering extremely low value. In this example, we will show you exactly how that works on Betfair. In the above example, if you place a bet on England to win at odds of 3.0 and they go 1-0 up during the match, what happens to their odds? They decrease. If England loses: our lay bet wins £40 (the backer’s stake) and our original back bet of £20 loses. If you want to learn how to trade on the Betfair exchange, there are numerous strategies to use. It is a case of how far down the rabbit hole you are willing to explore, so don’t expect this to even scratch the surface! But here are a few examples of betting strategies to get you off to a great start! Lay the draw is one of the most common Football betting strategies. This is done by laying the draw, and then when a goal is scored, the price of the draw should get bigger, especially if the favourite has scored. You then back the draw at a higher price and lock in profit. The key is to pick a game where there looks like there are going to be goals, and preferably scored by the team favoured to win the match. Scalping is the term to describe trading in small increments. So, backing at 1.6 and laying at 1.55 shortly after when the price has decreased. This reduces the risk and locks in a small profit each time. The best markets to do this in are the goals markets. The closer these markets get to their conclusion, the quicker the price will decay. So if you back under 1.5 goals with 20 minutes to go, the price may be around 1.3. But because the match is drawing to a conclusion, you will notice that the price will decrease rather rapidly. This gives the opportunity to back at 1.3, but lay at 1.2 all within a few minutes. This is by far our favourite method, and for a good reason. Bookmakers offer numerous free bets and the value that these provide can be leveraged on the Betfair exchange to make cash. 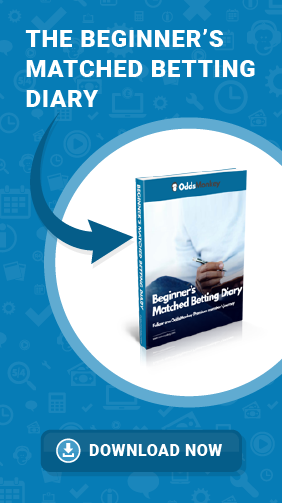 This process is called matched betting, and there are literally thousands of pounds worth of bookmaker free bets waiting for you to take advantage of. Wondering if matched betting is legal? No worries, read this post. If you have any questions about using the Betfair Exchange to matched bet, leave us a comment below. ◂ Is matched betting legal or illegal in the UK?